Horror movie killers traditionally disguise themselves with masks when stalking their prey. Hardware takes this process one step further and disguises the whole film as science fiction. Beneath the robots and dystopian future images, Hardware is all slasher film, and holds its own against any challengers. In an overpopulated and violent world, Moses Baxter (Dylan McDermott from “American Horror Story”) brings his girlfriend home a busted-up robot for her scrap metal sculptures. Intended as an apology for his time away from home, the robot resurrects and rebuilds itself and sets about exterminating any human beings that cross its path. Underneath the metallic sci-fi imagery are all the genres standards of traditionally slasher movies. 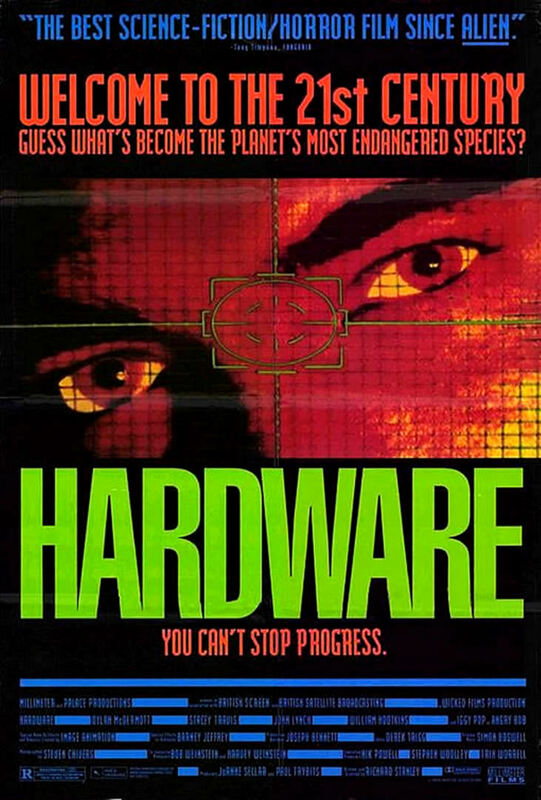 Hardware has the unstoppable killer, the despicable creep, the tough guy, the druggie, and plenty of gore. By disguising its horror roots in sci-fi trapping, Hardware ups the stakes. The threat is no longer limited to a camp or a small town in Illinois. The killer is not a singular entity, but one member of an endlessly repeatable series of robotic monsters. Hardware marries a post-apocalyptic setting with the surrealism of nightmares. The strobe-filled lighting, extreme contrast in colors, and industrial rock soundtrack create a unique vision that separates this movie from other films.